It’s not easy being a new parent. So discovered grade 8 students who, after spending a week caring for five-pound flour sack “babies,” better understood the demands of having a newborn. For a week in early February, as part of their health education curriculum, eighth graders were responsible for the well-being of their babies at all times, taking them to and from school, bringing them to classes and arranging for childcare when needed. Ensuring the safety of their sack babies enabled the students to earn points for both science and health education. However, they lost points due to any abuse or neglect of their babies. The project, while fun, was taken seriously, complete with day care centers set up for “parents” participating in after-school activities. Students also took turns serving as babysitters for each other. 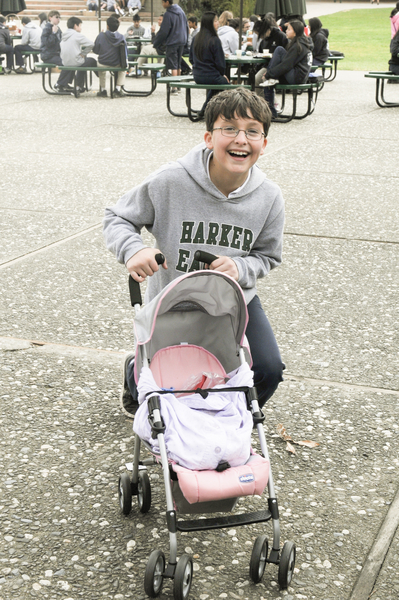 “The purpose of the project was to give the students an idea of what it is like to have a baby and be responsible for it while at school for an entire week,” said Harker P.E. specialist Chrissy Chang, who annually spearheads the middle school project.